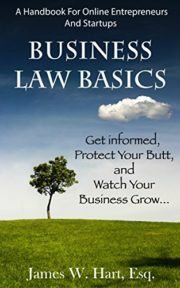 Business Law Basics is an entry-level legal handbook for online entrepreneurs and startup businesses. Written by intellectual property and trademark lawyer James Hart, “BLB” begins with the stories of Fred and Sally, two e-commerce entrepreneurs with entrepreneurial dreams to break free from their 9-5 jobs. Fred’s story ends in bankruptcy and illustrates many of the mistakes that the author has seen all too often from his entrepreneurial clients, while Sally creates a lasting and successful business by following good advice and covering all her legal bases along the way. From there, Business Law Basics walks you through an extensive discussion of various legal entities, giving the pros and cons of each. You will learn how a properly structured legal entity can protect you legally and save you money at the same time. So if you want to know more about sole proprietorships, partnerships, S and C-corporations and Limited Liability Companies (LLC’s), this is a tremendous resource. Finally, you will find a value-packed list of the 10 most common mistakes made by entrepreneurs on a daily basis. From failing to plan, to naming issues, to not having contracts in place, this list has it all. If you want to know how to start an online business, specifically what NOT to do, then this is the perfect book for you. 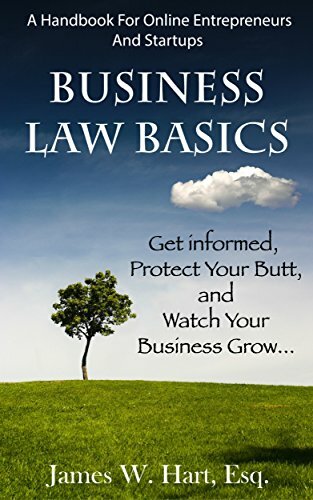 So whether you are just starting out with your online business, or you are a seasoned entrepreneurial veteran, this legal handbook will have something in it that you can put to use in your own virtual business today.